For those that haven’t been following along on Facebook and elsewhere, Susie and I bought a place overlooking Center Hill Lake last year. Right now it’s our weekend getaway but eventually, hopefully within a couple years, it’ll be our permanent home. The house sits on a about 1.25 acres of very steeply sloped land with three quarters of it being woodland. The northeast portion is bounded by property owned by the Army Corps of Engineers which runs down to a cove on the lake. Since we’ve been here I’ve had a notion that I’d eventually like to create a trail down to the bottom of our property. Originally that was going to be something to pick at after taking care of a million other more important projects “up top”. Part of that was trying to de-bramble / vine a section towards the top where the previous owner had opened up a view by cutting down a bunch of trees and leaving them where they fell. Once I started to get that cleared away I found myself thinking more and more about a trail. Another thing that happened was learning a bit more about the geology and topography of this area of Tennessee, especially as I found myself on Chuck Sutherland’s web site over and over again. Chuck has some pretty amazing maps which got me wondering if I might be able to use the GIS data from the State of Tennessee to create my own map which I could then use to guide the path my trail might take. After discovering QGIS I was able to do just that. The trail doesn’t follow the path I drew up exactly, but it ended up being pretty close. Armed with my map, hoe, bowsaw, and pruner I spent the last few weekends making my way down the hill. As I did I started to notice the wide variety of flora down there. Spring having arrived probably made this much more noticeable, but as I encountered each interesting new plant I’d take a picture and look it up later. 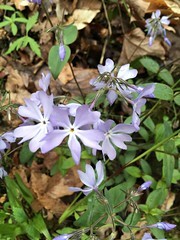 A buddy of mine was visiting a couple weekends back and showed me an app he uses to identify plants called PictureThis. PictureThis makes plant identification so much easier! 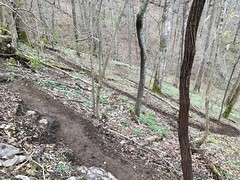 Well, yesterday I finished the trail! Okay, there are several places that could use a little more work. Some old logs that it would be nice to cut through, some widening, and, if my wife has anything to say about it, some sections that are still too steep that need to be de-steepened. So maybe not finished finished but you’re about 100 times less likely to break a leg trying to get to the bottom now. This morning I took all the photos that I made as I was creating the path and threw them in an album on flickr. 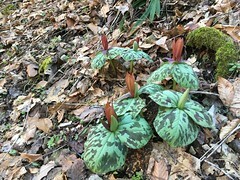 It includes all my best guesses of the plants I found along the way. And a couple other things I found along the way. Now to start thinking about the 2 or 3 spur trails I’m thinking I might need. Nice website Casey. Every once in a while, I stop on one of your Facebook posts and read about a plant on your property or a tidbit about your ancestry. You and your wife share similar interests as myself and husband. We are working on a property in the UP. Though we are identifying plants and animals tracks and improving our view. We haven’t gone as far as creating a website! It’s been in the back of my mind, but tech savvy is not in my blood! One day, maybe. Thanks! I’ve had this web site in one form or another since the late 90s I think. It’s been awhile since I posted here with any regularity though. I need to change that. Good job, cousin. I’m very happy for you guys and glad you’re less likely to break your leg. Please, keep posting the photos. I’m sure everyone enjoys them as much as I do. Thanks! I’m wore out though. I need a vacation to recover from vacation.